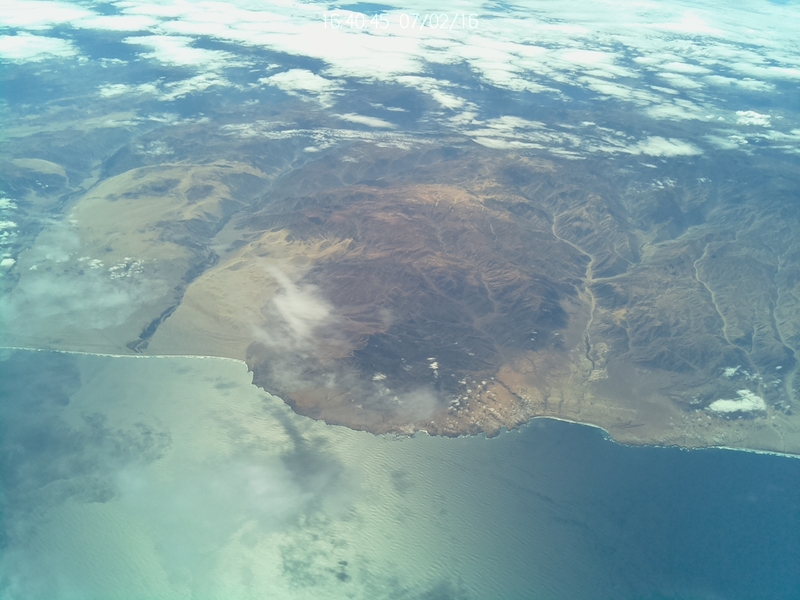 View of Peru’s coastline as seen from NASA’s Super Pressure Balloon July 2. NASA completed the 2016 super pressure balloon flight over Peru at 3:54 p.m. EDT Saturday, July 2. The balloon flew for a record mid-latitude flight of 46 days, 20 hours, and 19 minutes. The groundtrack of NASA’s Super Pressure Balloon is pictured here. 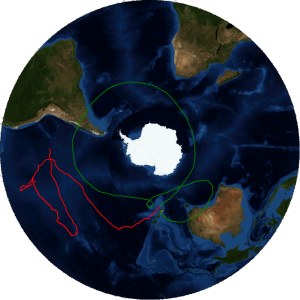 The green track represents the first mid-latitude circumnavigation and the red represents the current track. The balloon is flying over the Pacific Ocean nearing the west coast of South America. Forty days at float as of Saturday, June 25, and NASA’s super pressure balloon (SPB) is presently flying above the south Pacific as it continues on its long-duration technology test and science flight. For the past two weeks, the balloon has etched out a whimsical groundtrack over the Pacific, slipping out of the more southerly stratospheric cyclone pattern and then floating nearly to the equator before turning west, south, and now east toward South America. 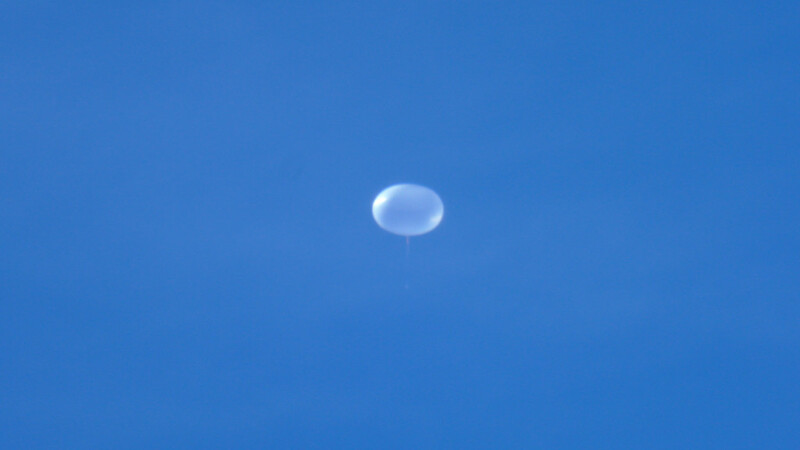 The balloon is designed to float at a constant pressure altitude of 7 millibars. However, the actual altitude at float is also dependent on the environmental conditions where colder weather below could lead to lower float altitudes. 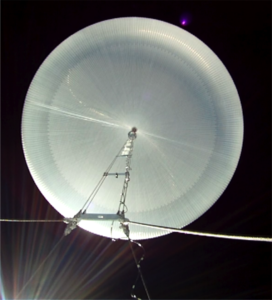 To date, the balloon has flown over a number of cold storms, which has resulted in the balloon losing its differential pressure and experiencing some altitude variance at night. 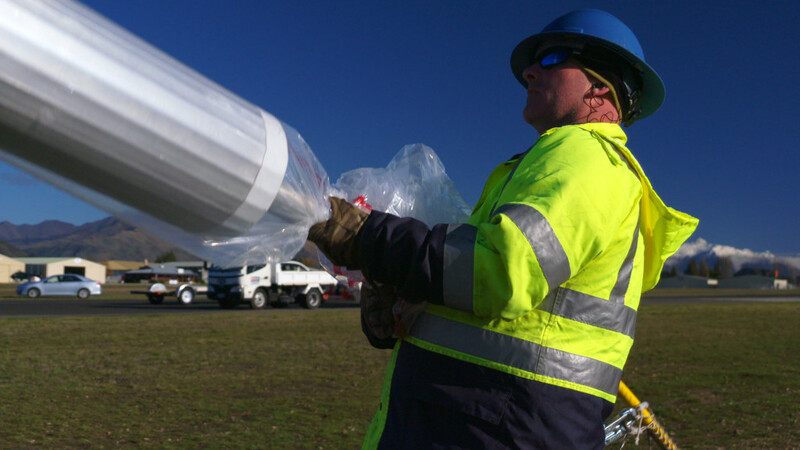 “The heating and cooling cycle puts a lot of stress on the balloon, but it was engineered to withstand the extra wear,” said Fairbrother. 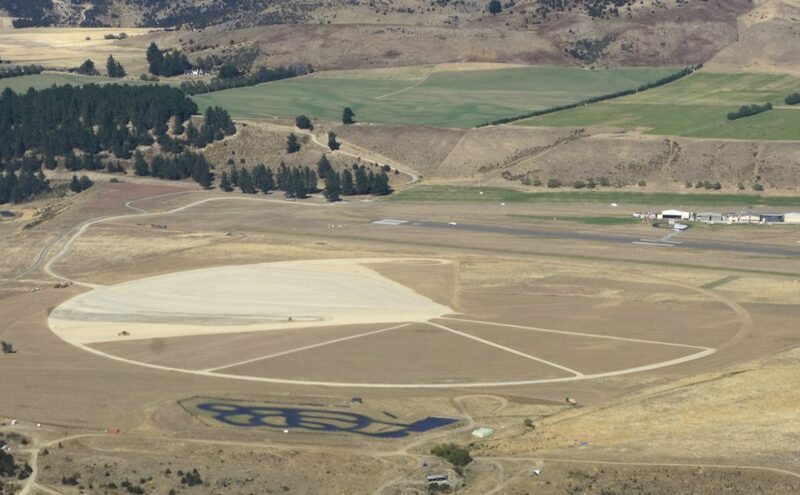 The previous record flying through the day/night cycle was 32 days, 5 hours, set in 2015 with an SPB flight that launched from Wanaka, New Zealand. 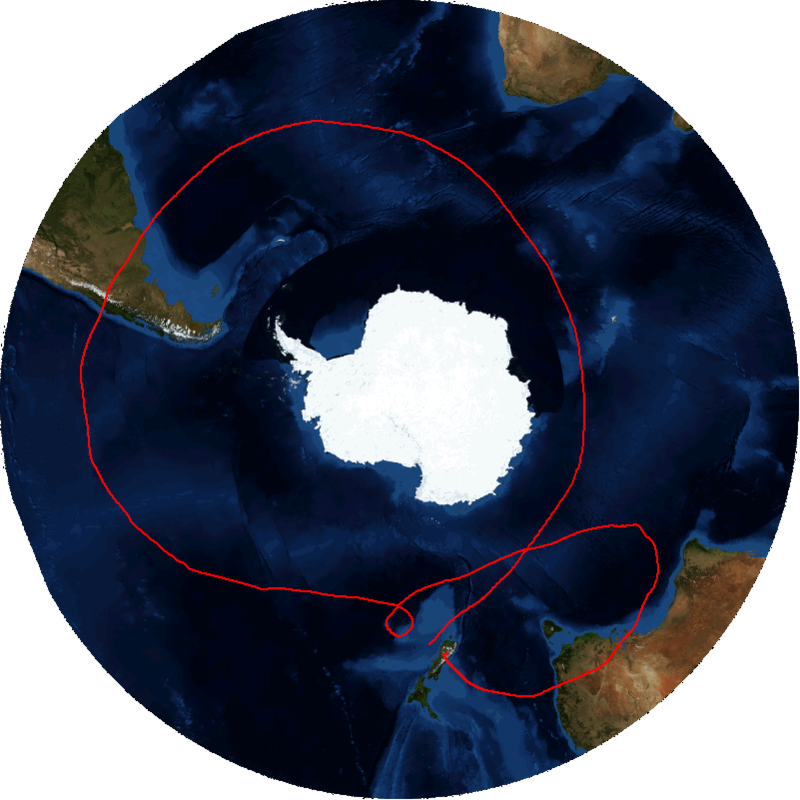 The overall record for any SPB flight is 54 days, set by a 7-million-cubic-foot SPB flight over Antarctica in 2009. Aside from the technology test of the balloon itself, the SPB is carrying the Compton Spectrometer and Imager (COSI) gamma ray telescope. The COSI team reports that the science instrument continues to collect good data. While the Compton Spectrometer and Imager (COSI) gazes into space, another experiment is listening for whispers from the Earth itself. Housed in two humble white boxes tucked behind COSI’s solar panel, a triad of microphones are recording infrasound – sound too deep for humans to hear. Infrasound sources include volcanoes, earthquakes, ocean waves, the aurora, explosions, rocket launches…and many more. The power of infrasound lies in its ability to travel vast distances. Higher frequency sounds dissipate rapidly: this is why bass notes carry much further than treble notes, and why thunder from a nearby lightning strike is a sharp crack, as opposed to the muffled boom of a faraway storm. The exceptionally deep sounds in the infrasound range can travel around the world multiple times. Networks of ground-based infrasound detectors are located around the world. The sensitivity of these microphones can be their own worst enemy, however. The slightest gust of wind can overwhelm faint acoustic waves from the other side of the planet. Also, the temperature structure of the troposphere (the lowest layer of the atmosphere) tends to channel sound waves away from the Earth’s surface. 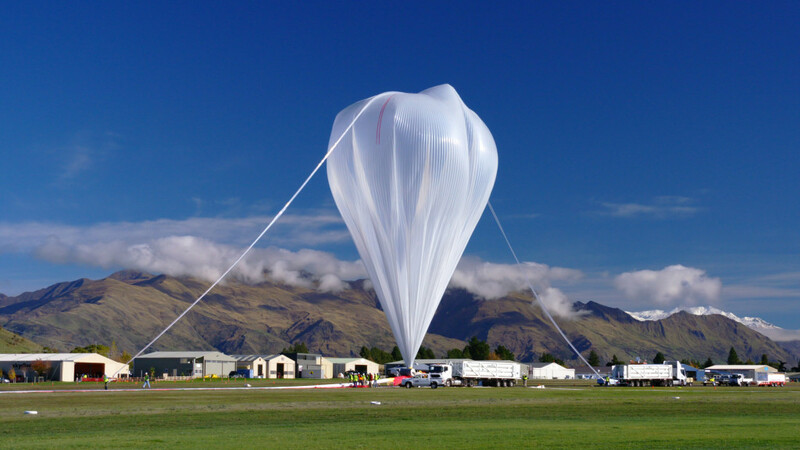 Infrasound sensors on balloons may offer significant advantages. Since they move at the same speed as the wind, they never feel its effects. Modeling suggests they can record sounds at much greater distances compared to those on the ground, and perhaps detect signals that never reach the surface at all. Despite this, no infrasound microphones have been deployed above 8 kilometers from the early 1960s to 2014, a gap of over half a century. Thus, the true diversity of atmospheric sounds remains unknown. 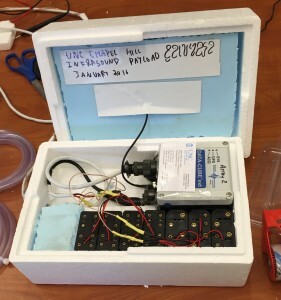 The infrasound payload on board the super pressure balloon was developed by the University of North Carolina at Chapel Hill. The exceptionally light (<3 kg) instrument package has three primary objectives: 1) characterize the sound field of the stratosphere 2) record an “event” (earthquake, bolide, etc) and 3) quantify the impact of local acoustic or electromagnetic noise from COSI and the balloon itself. If successful, this experiment will collect the most infrasound data ever recorded during a single flight; indeed it will increase the time coverage of available acoustic data in the stratosphere by an order of magnitude. The detection range and sensitivity of free flying acoustic stations will be well characterized, and the magnitude of humanity’s contribution to the global infrasound wave field will be quantified. Unlike COSI, however, the data are not telemetered. The recorder must be recovered, or the microphones will take their secrets to the bottom of the sea. Thus, the UNC team watches nervously as the superpressure balloon drifts across the open ocean, and crosses their fingers that nothing goes wrong. NASA’s 18.8 million-cubic-foot super pressure balloon hit another milestone at 9:17 a.m. EDT Monday, May 31, crossing the 169.24 east longitude line, officially completing its first circumnavigation of the globe. 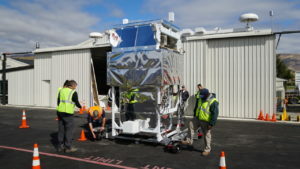 The balloon, flying the Compton Spectrometer and Imager (COSI) payload, achieved the milestone 14 days, 13 hours and 42 minutes after launching from Wanaka Airport, New Zealand. At the moment the balloon crossed the meridian, it was flying at an altitude of 110,170 feet heading northeast at 53.85 knots. The NASA Columbia Scientific Balloon Facility, operated by Orbital ATK, continues to monitor the balloon’s flight at the facility’s control center in Palestine, Texas. “Our tracking data shows the balloon is in good health and performing as expected thanks to the expertise of the super pressure balloon team and our experienced mission specialists at the Columbia Scientific Balloon Facility. 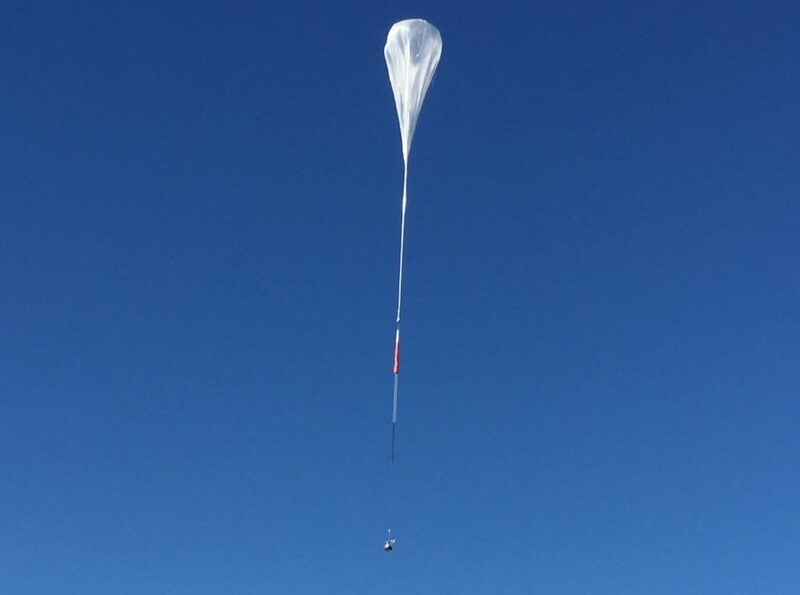 The completion of the balloon’s first mid-latitude circumnavigation marks a key mission milestone and brings us one step closer in setting a new flight duration record,” said John Pullen, vice president and general manager, Technical Services Division of Orbital ATK’s Space Systems Group. 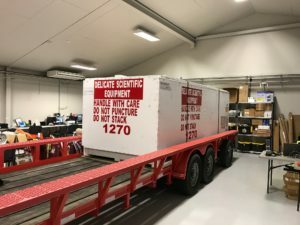 “We are also pleased that important science data, such as the discovery of a gamma ray burst, is already being collected on the mission which reinforces the capabilities of NASA’s scientific balloons in providing affordable, near-space access for conducting scientific investigations,” said Pullen. Weather permitting, the balloon can be seen from the ground, especially at sunrise and sunset, as it continues on its globetrotting journey. 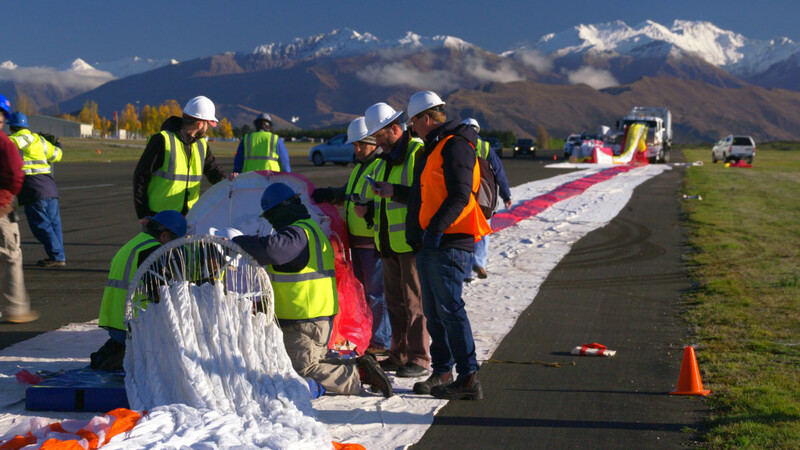 People can track the real-time location of NASA’s super pressure balloon at this website: http://www.csbf.nasa.gov/newzealand/wanaka.htm. NASA’s super pressure balloon is projected to begin transiting South America at 10 p.m. EDT, Friday, May 27, as it continues to fly its around-the-world journey. NASA’s super pressure balloon is quickly closing in on another milestone in its potentially record-breaking flight: first South American crossing. 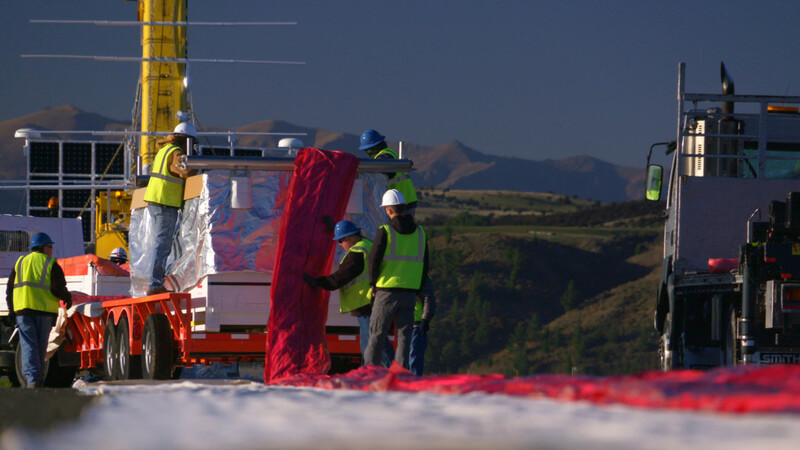 Eleven days after lifting off from Wanaka Airport, New Zealand, the balloon is on a trajectory to cross into South America at approximately 10 p.m. EDT, Friday, May 27, quickly transiting both Chile and Argentina. 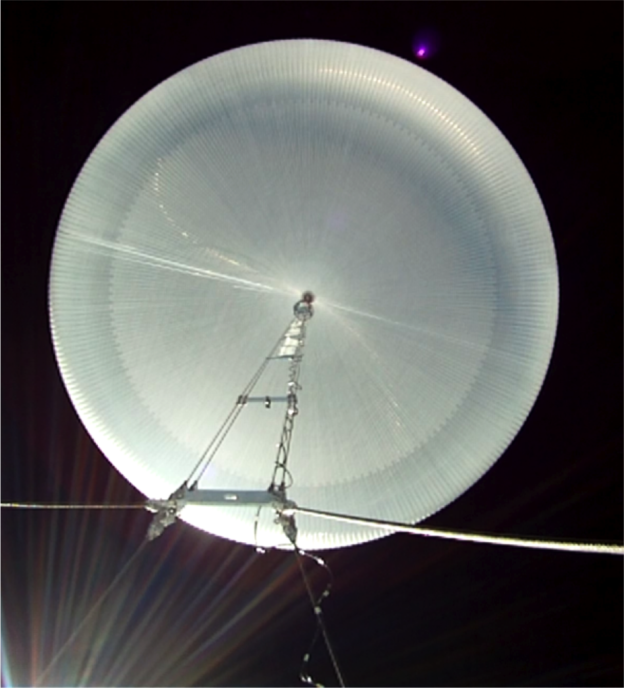 The balloon flight is monitored real-time from NASA’s Columbia Scientific Balloon Facility in Palestine, Texas. Before any land overflight occurs, a thorough assessment is made of the balloon’s health, the performance of the command and control electronics and the forecast trajectory is analyzed from a safety perspective before beginning overflight operations. The Compton Spectrometer and Imager (COSI) payload flying on the super pressure balloon is healthy and continues to collect and transmit data on multiple observed galactic phenomena. Forecast wind speeds and directions in the stratosphere show the super pressure balloon could complete its first mid-latitude circumnavigation as early as Tuesday, May 31. NASA predicts the balloon will complete a circumnavigation once every one to three weeks. For more information on the super pressure balloon mission, visit: https://www.nasa.gov/feature/nasa-super-pressure-balloon-begins-globetrotting-journey. 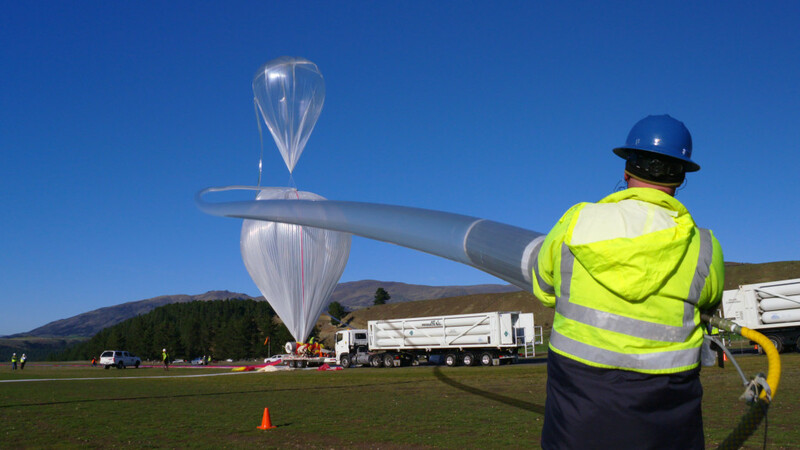 NASA’s super pressure balloon took flight from Wanaka Airport, New Zealand, at 7:35 p.m. Monday, May 16 (in EDT), on a flight aiming for long-duration at mid-latitudes. Video and pictures from the launch operation follow.